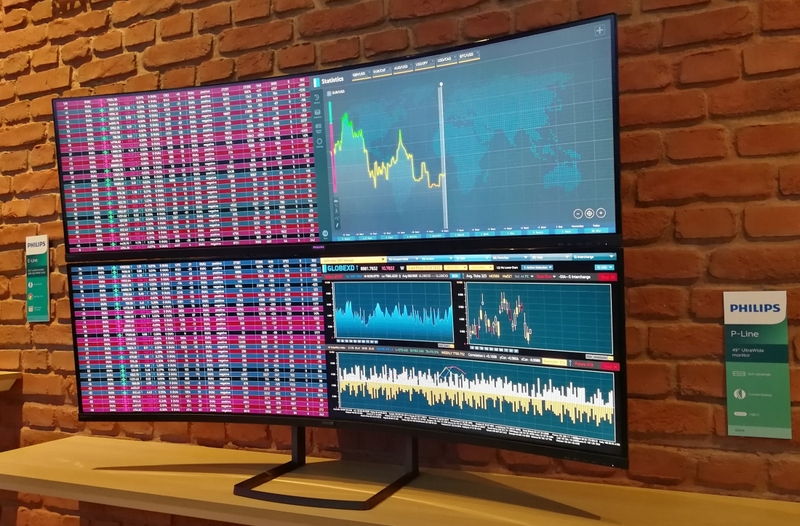 One of the highlights of last year’s IFA trade show was Philips’ 49-inch ultrawide monitor, the Brilliance 492P8. Now, the company has announced the official US release date and revealed that its display will ship with an increased resolution. Back at the Berlin event, the Brilliance 492P8 featured a 3840 x 1080 resolution, but Philips is upgrading it to 5120 x 1440 while keeping the previous 32:9 aspect ratio. The increase means the 492P8 is now the highest resolution 32:9 display to date, beating Samsung’s 49-inch CHG90, which is 3840 x 1080. Other than the jump in pixel count, the rest of the specs remain unchanged. The VA panel has a 1800R curvature, sports a brightness rating of up to 600 cd/m², a contrast ratio of 5,000:1, and 178-degree horizontal and vertical viewing angles. Philips says connectivity comes in the form of HDMI, DisplayPort (DP), VGA, USB-C, Ethernet, and USB 3.0 ports. Philips hasn’t mentioned the monitor’s refresh rate or whether it features support for variable refresh rate technology, and it seems to lack HDR. It appears that the 492P8 is aimed at the professional market and those looking to up their productivity, rather than gamers, so it’s unlikely to feature either Nvidia’s G-Sync or AMD’s FreeSync. For those who want to game on a double-wide display, Samsung’s aforementioned 49-inch monitor would be a better option. It may come with a lower resolution but it boasts a 144Hz refresh rate, FreeSync 2, and HDR. And as it’s essentially two full-HD displays stitched together, rather than two QHD screens, it shouldn’t require a monster graphics card for gaming. The Philips Brilliance 492P8 will arrive in the US sometime during the fourth quarter of 2018. No word yet on pricing, but it reportedly cost $1077 back in September before the resolution upgrade, so expect the price to have gone up. Samsung’s CHG90, for comparison, is available for around $1000.